As we all know that a galaxy of stars was present at the TOIFA grand celebration in Dubai. 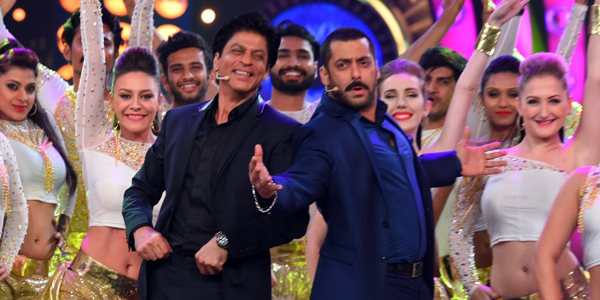 The two leading stars of Bollywood who are cherry on the cake at the event were King Khan- Shah Rukh Khan and Salman Khan. Dubai is also called Shah Rukh Khan's second home, so he had to host a big bash for some of his industry close friends. Sources say that, the party took place at his hotel suite with Salman Khan staying the night for an intense conversation. The star who attended the party was, Ranveer Singh, Jacqueline Fernandez, Parineeti Chopra, Yo Yo Honey Singh, Sanjay Leela Bhansali and many more from the industry. According to a close source, "The two actors were engrossed in a chat that went on till the wee hours. No one was allowed around them. Once Salman entered, the party became livelier and his bonding with SRK was just too cute. They were seen enjoying each other's company. For the most part of the evening, they seemed to be having a serious conservation. But in between, they were cracking jokes and giggling too." Seems like, the two superstars had been bonding big time at the awards show and had also rehearsed together with ace choreographer Shiamak Davar for their stage performance. Now the "Jabra" groove will ring across music players and radio stations in Arabic nations too. Don't be surprised if you hear this catchy number in a taxi on the streets of Dubai or Riyadh! "Jabra", the multi lingual anthem from Yash Raj Films' forthcoming film 'FAN', has rocked Indian music charts all over India and its appeal is no less with NRI listeners and Bollywood movie buffs worldwide! 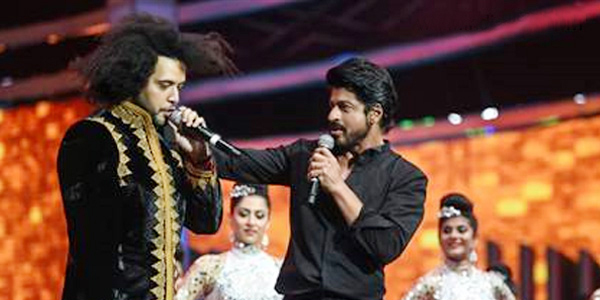 Which is why, to exponentially expand reach and add to this unique Shah Rukh Khan film’s global appeal, the Fan anthem has been recorded in Arabic by leading music artist, Grini. This is not the first time that YRF has utilised popular global singers for their films. The Studio is a trendsetter in this sphere, having launched a Hindi song dubbed in Thai, Spanish and Arabic, with 'Dhoom 3' (Dhoom Machale by Naya). A thumping track, this one had become a chart buster across Arabic music stations and still plays in the region. YRF has always tried to find innovative ways to give ownership of its films and music to local audiences and connect with the people that matter - FANS. To enhance the film's value with Arabic speaking audiences, YRF has collaborated with Platinum Records to create the Arabic version with Grini. The strategic move apart, this Arabic Jabra Fan anthem once again highlights the immense popularity Shah Rukh Khan enjoys worldwide. In many international markets, he defines the ultimate matinee idol, over and above Hollywood’s leading names. A unique concept at heart and with the best contemporary filmmaking techniques in place, FAN promises to break new ground in international markets and add to Bollywood’s overall appeal in the world!